Société Auguste Vestris - The skies - and how to get there! Etoile, professor to the corps de ballet of the Paris Opera. Known as exercices d’allegro in earlier times, jumps are a logical stage in the dancing lesson, and represent - in every sense of the word - its high point! In general, jumping simply involves launching the body into space. If the jumper be a dancer though, he will appear, if but for a moment, as though suspended. In the dance, the jump is a paradox, as compared to sports activities, where it will be quantifiable and pertain to the notion, not of taking to the airs, but rather to results. We, however, are in the theatre. Here, the dancer must conceal all effort, that interloper serving only to obstruct communication. Although the jump happens to be the most strenuous of all efforts, it must, paradoxically, appear quite the opposite. For the audience to perceive so highly complex a movement, one initiated in the mind, as dance, mastery of its sculptural dimension is crucial. Otherwise, even were every gesture to be ideal from a physiological standpoint, one would remain, as it were, on the playing fields rather than in the theatre! Until the late 18th century, the dancer merely skimmed the ground. There was no thought of leaping into the air: the only dance was terre à terre. Then, in France, early in the 19th century, great changes in musical composition spurred bold technical innovations in dance. an architectural conception of space: grandes traversées, diagonales and manèges, where technique reaches a paroxysm of virtuosity. Equally distributed, so to speak, around the central axis, these are the most basic jumps, whereby the student acquires the notion of aplomb, and balanced muscle-strength in both legs. Here we have the wonderfully variegated family of sissonnes, taken from every position (at the ankle, en retiré, à la 2nde, in Fourth, en arabesque, en attitude), including all tours en l’air taken from Fifth and landing on one leg. This is the large assemblé family, which can be beaten (battu) and en tournant. In the latter two families, the notion of weight transfer and plastique appears: through the play of oppositions, the dancer lends a precise outline to each basic position, both in the airs, and on landing. The family of temps levés, cabrioles, ballonnés. In the above two families, the body is launched into space, there to trace its design, it being ever-harder to sustain the shape (plastique). Henceforth, understanding how the torso, rather than the legs, commands the action, becomes indispensable. Each of these families releases a specific palette of hues and sensations (ressenti): while the sissonne is explosive, bursting towards its goal, the temps levé seems to cleave space. As for the grand jeté, it strides through the airs. From the point of view of planes and “aspect”, three jump-categories can usefully be identified. Depending on their respective dynamic, the musical accent will be stronger either on the downbeat, or on the upbeat. Petits sauts and petite batterie, known as terre-à terre steps. The musical accent will be stronger on the downbeat. Whether moving upwards, or sideways – the turnout being essential to function here - these basic steps, come down to us from the ballet de cour, may be either simple or beaten. Their defining characteristic is that they skim the floor. Here, the joy of dance lies in speed. A relaxed upper body is set off against the feet and legs as they weave nimbly in the air, sparkling like the gemstone-facets. In an enchaînement, they flit by like flashes of lightning, to a degree that the eye can scarce register them! Taken singly, they cover little ground. Danse de ballon (including ballon lent). Performed at middling-height, here the joy of the dance lies in that wonderful elasticity, as one bounds and rebounds. As for ballon lent, the dancer seems to be weightless, as though drifting through tufts of clouds. Extremely taxing, ballon lent calls for a deep, soft plié on landing. Thanks to the ever-shifting directions of the épaulement, the aura surrounding these steps recalls the subtle gradations of chiaroscuro. These jumps, that cover fairly little ground, are central to the Romantic repertoire, and more especially to Bournonville, whose science of linking steps (pas de liaison) is most original: a glissade may become a step in its own right, while a brisé be a mere preparation. Grands sauts. Soaring high above the ground, the joy of the dance lies in taking to the airs. Their aura is a little more rustic, the shapes being large and bold in outline. Owing to the need for momentum (élan), the dancer covers a good deal of ground. Unlike “jazz” phrasing, that switches between running and explosive jumps, in classical dance the phrase is lent shade and meaning by skilful use of linking steps, one step succeeding another as though inevitably. The sub-category known as grande batterie took off – literally ! – in the 19th century, to become the crowning glory of male technique: on two feet (a series of entrechats 6), or de volée (assemblés-entrechats 5, sissonnes de volée, double-cabrioles). Incidentally, the spectator’s eyes deceive him: although flight is what he thinks he sees, paradoxically the grands sauts and grande batterie call for a strong downward thrust. Even when simply standing still, the classical dancer may be singled out from all others by his deportment, a time-honoured way of holding oneself that is both noble and dignified. As we have just seen, it is not the legs’ thrust alone, but how the torso interacts with space, that is critical to building the power to soar. Great forces come into play here. In the action of jumping, the deep muscles and ligaments must be properly toned, in order that the bone-structure withstand great centrifugal and gravitational forces. Far from being purely decorative, deportment is thus functional and contributes to safely building advanced technique. The corset of deep abdominal muscles allows the backbone to be properly aligned; in keeping the shoulders broad and well-opened, the sternum can be freed up without stiffening the neck or arms. All these factors are key to posture. Once the upper body feels as though lifted, the next step, the “suspension” one needs if one is to soar, becomes that much easier. That is why, in daily class, grands ports de bras and adagio must invariably be given in the middle. By having the arms and legs move quite systematically through 1st position, the dancer learns to centre the forces at work, so that once in the air, he can free up the requisite energy. Allow me to share own personal experience, having been a dancer with very flexible hips and ischio-femoral muscles, but lacking in natural ballon. Many grands sauts (grand jeté, fouetté arabesque,cabriole, grand jeté en tournant etc.) are prepared by a battement in 4th devant. Now, if the right-angled battement (the angle being measured between the torso and the leg) is to do its job as a fulcrum in space, and let the dancer “rise out of his hips”, “leap over an imaginary fence” (for grands jetés), that battement must stop at la hauteur i.e. it must stop at hip-level. Again, for both grands assemblés (battus) and petite batterie, the preparatory battement should not be allowed to fly up beyond mi-hauteur (knee-height). The dancer must learn to carefully note, and control, these sensations at the barre, while avoiding all spectacular leg-lifting that he will neither be able to control nor use later on. In classical dance, elasticity and good muscle tone must be balanced. Once a ligament have been stretched out, its elasticity will be lost for good, along with the ligament’s actual function, viz., to control the joint’s ambitus. The disastrous impact on elevation of the craze for mind-boggling écarts, has become only too apparent over the last twenty years. To each category of jump there corresponds a degree or specific quality of plié, that must be dosed, adjusted, according to context. The heel maintains contact with the floor at all times, the back of the knee ‘breathes’, the back is properly aligned along the line of aplomb, and the knee, aligned with the hip and the foot. That being said, the plié is simply an intermediary. Countering the torso’s action, it becomes the springboard for the jump. The deeper the plié, the higher the body can rise. 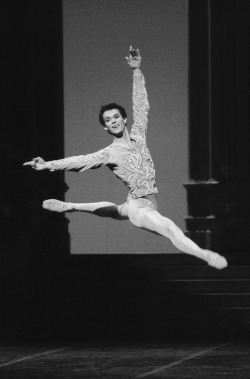 The opposition between the plié and the torso is best perceived in the battement fondu, critical to preparing a good jump, and one advised by masters such as Tamara Karsavina and more recently, Vera Volkova. Originally, battement fondu was performed straight onto the demi-pointe, the leg extending only to mid-height; nowadays however, it is performed first with the heel on the floor, then on the demi-pointe, then à mi-hauteur, à la hauteur or higher still, which makes the exercise perfectly useless by turning it into one for adagio work. When correctly executed, battement fondu sets up a counterbalance between North and South, between upper and lower body. Against the deep, slow plié, the body rises as though emerging, pushing off from the floor (repoussé), resistance being the watchword here. The action of both legs is synchronous, creating an elastic, almost ‘hydraulic’ dynamic, rather as though a piston were being alternately pressed and released. Dancers who lack natural ballon will find it worthwhile to focus, consciously, on how this three-stage technique works. Before: Thanks to preparatory steps - glissade, chassé, pas de bourrée, pas couru, contretemps etc., as the dancer covers ground, acceleration, and resistance against the floor build forwards-momentum. Then the jump will be launched thanks to the impulse given by the heel. The theory behind this stage is not unlike that in certain sports. 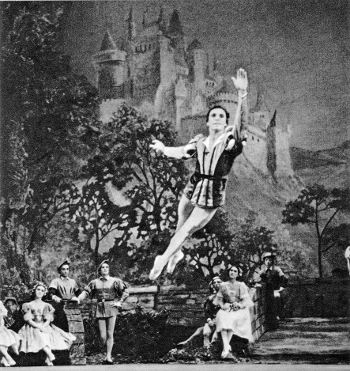 During: The dancer is drawn into air by the musical accent. In a split-second, he will take on one of the shapes studied in adagio practice. After: On landing, the dancer must consciously recover the line of aplomb. Meanwhile the outline traced by the jump - thanks to épaulement and the port de bras - will persist in the mind’s eye of the spectator, even after the dancer have reached the floor. Late in the 18th century, masters such as Pierre Gardel or Auguste Vestris, followed by a stream of illustrious disciples, taught the dancer to stride the airs – this was the Golden Age of male technique. Over the past fifty years though, feats of derring-do from the ex-USSR (double assemblé, double saut de basque en dehors and en dedans, révoltades, not to speak of certain novelties that in fact qualify as acrobacy), at the human body’s uttermost limits, call for exertion so strenuous that it can no longer be concealed. Such steps not only disfigure the classical vocabulary, but the very function of dance as a major theatrical art form. 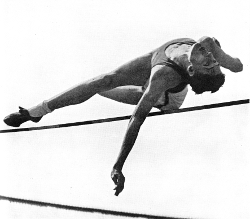 By the way, since 80% of male technique is built on jumping, the wisdom of a selection policy that favours a physique so streamlined as to be virtually androgynous – and thus necessarily injury-prone - is open to dispute. Before the ballerina first learnt to rise on pointe, and then to undertake virtuoso pointe work, jumping was central to female technique as well, as one sees from Bournonville’s ballets, or even those of Marius Petipa. In the 19th century, terre-à-terre ballerinas were distinguished from the ballerine d’élévation, the latter being possessed of a much rarer quality. To my mind, the state of being on pointe is precisely what happens in jumping: the upper body is suspended in space, while the limbs float free. In our own day, pointe shoes are more comfortable, and this does seem to encourage the dancer to go over the shoe. Moreover, the fashion for an over-arched foot and excessively slender legs, along with dancers’ relentless efforts to achieve 180° écarts, all contribute to poor posture. Typical as such posture may be of our contemporaries, in a ballerina this will tend to drive her down onto the pelvis and down into the shoe. Allow me to conclude with a tribute paid by Ekaterina Vazem, a celebrated terre-à-terre ballerina, to Adèle Grantzow (1845-1877), who had studied with the great teacher Madame Dominique at the Opéra, before refining her technique with Arthur Saint-Léon, under whose tutelage she acquired her virtuosity on pointe. Ekaterina Ottovna Vazem: Memoirs of a Ballerina of the St. Petersburg Bolshoi Theatre (1867-1884). Published in The Journal of the Society for Dance Research, Vol. 4, No. 1 (spring 1986).